Despite the name that you may find a little unoriginal, iSoftbet has come up with an amazing game that that is a real simple game to handle and with a rewarding with its jackpot even though the stake is quite fair priced. Known for their incredible progressive jackpots, iSoftbet has made Absolute Super Reels quite easy even for a new gambler to understand and even begin to play and win immediately. The game is comprised of five pay lines and it is a progressive jackpot that will allow for the maximum jackpot of 40,000 coins or $20,000; giving any gambler a few thousand reasons to pick this slot game as part of their gaming exploits. The features of the Absolute Super Reels may be a little unconventional when compared to other games but that is what iSoftbet may have been going for just to make it that much more different from the other slot games out there. Some of the odd combinations of features that are associated with the slot game are the fact that it doesn’t have wild cards, no scatter symbols as well as the lack of free spins. It does however have a bonus game and multipliers. A gamer can wager as little as 0.01 per line while playing the Absolute Super Reels. The game allows for a maximum wager for all five pay lines to be a total of 37.50 per spin which also makes it the highest stake possible in the entire game. The limit for coin betting vary from as low as 0.01 and players are allowed to bet as much as 15 coins per line which is an usual for most slot games, but as we said, Absolute Super Reels is not your average slot game. Another thing that sets the game apart from most other slot games is the fact that the game gives a player the chance to get a huge bonus without wilds and scatter as is with other games. 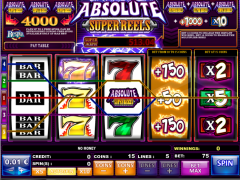 While other slots will have five lines, Absolute Super Reels will give you fifteen a feature that most people would find very uncommon, but we guess iSoftbet wanted to make this one unique and very interesting something that they succeeded at very effectively. Absolute Super Reels may be different from other slots in terms of features, but the icons are all the same and reminiscent of all the other slot games you have ever played. There is the usual double and treble bar icons and the sevens are also all there. The last two reels on the game are separated from the main game and will act as a multiplier for the two coins during the game. This makes the slot game a five reeled machine that only actually features three. Absolute Super Reels, is a breath of fresh air when it comes to slot games and iSoftbet have certainly outdone themselves in creating a game that is essentially different from other slot games in the market. It may not be simple, which iSoftbet is known for, but the game will not disappoint in the features department. What it lacks for in simplicity, it makes up for in additional features that are bound to spark your interest and keep you yearning for more. Most gamers are in it for the fun as well as the money and this progressive slot game will give you both in a nicely done package just as you would expect from iSoftbet. There are a number of casinos online that will allow you to test drive Absolute Super Reels for free before you start to wager real money. The game is guaranteed to bring joy to any gambler even a beginner as it is not that complicated to learn. Absolute Super Reels is the game that is maybe going to change the face of the slot machines in the online gaming scene.